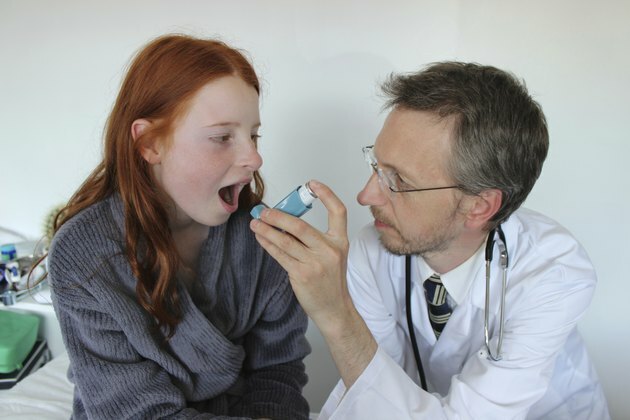 Asthma is a disease of the lungs that causes narrowing and constriction of the airways. An inflammatory or allergic component to the disease causes swelling of the bronchial structures in the lung. With asthma, the disease is always present but typically becomes a problem only with a flare-up, or asthma attack. There is no known cause, but there is a definite link to heredity. Asthma is treated with oral or inhaled medications, such as albuterol sulfate, which has some benefits as well as side effects associated with its use. The Centers for Disease Control and Prevention state that asthma is one of the most common long-term diseases affecting children; many also suffer symptoms into adulthood. Along with narrowing of the airways, it also causes excess production of mucus, which further blocks the airways. The symptoms include wheezing, shortness of breath, tightness and pain in the chest and coughing. The symptoms of asthma can be minor to severe -- even life-threatening -- depending on what triggers the attack. Asthma triggers include exercise, chemical irritants, cigarette smoke and allergens, such as pollen, dust mites and pet dander. The key to controlling asthma is preventing the attacks from occurring. Finding the triggers for asthma attacks and avoiding them is the first line of treatment. Medications are available to treat asthma both long-term and in a rescue situation during an attack. Long-term medications include inhaled corticosteroids and long-acting beta-agonists. There are several different types of rescue medications, one of the most popular being the short-acting beta-agonist albuterol sulfate. Albuterol sulfate is sold under the trade names Proventil and Xopenex. It is a short-term beta-agonist that acts rapidly to reverse the symptoms of an acute asthma attack by dilating constricted airways. It begins reversing an asthma attack within minutes and its effects last for several hours, according to MayoClinic.com. One important benefit of inhaled albuterol sulfate is it's considered safe for use in children over 2 years old. Albuterol sulfate can be taken every 4 to 6 hours to control an asthma attack. Albuterol sulfate is meant to treat acute, or sudden onset, symptoms of asthma and should not be used as a mainline defense against the disease. It is possible to develop an allergy to albuterol sulfate, the symptoms of which can mimic the respiratory symptoms of an asthma attack along with a rash, hives and itching. Excessive use of an inhaler containing albuterol sulfate can cause the life-threatening condition paradoxical bronchospasm. It can also cause a rapid heartbeat, chest pain, nervousness, tremors, mood changes, nosebleeds and insomnia. It interacts with certain medications, including some antidepressants, blood pressure medications, diuretics and epinephrine. Be sure to inform your doctor of all the medications and supplements you are taking if you need to add albuterol sulfate to your medication regimen.